THANK YOU FOR VISITING DANIELLE MARIE. PLEASE, TAKE YOUR TIME AND LIGHT A CANDLE OR LEAVE A CONDOLANCE OR TRIBUTE TO OUR BEAUTIFUL ANGEL. HER FAMILY IS FOREVER GRATEFUL. 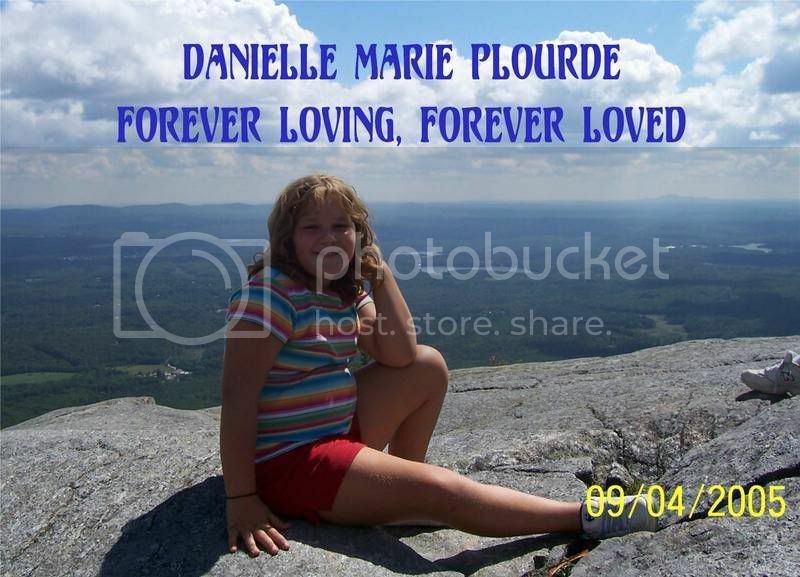 This memorial website was created in the memory of our forever loved one, Danielle Marie Plourde who was born in Hartford, Connecticut on January 04, 1995 and was taken from her earthly home on February 20, 2006 at the age of 11. The Song playing in the background was especially written for Danielle Marie. It was written and recorded by Dan Sweetman. Dan is a songwriter and performer from Southington, CT.
We are SO VERY GRATEFUL that Danielle Marie will be remembered with this sad, yet beautiful song. The tears on my pillow have now dried. Of remembering you and the day you died. My eyes are soar and red from the tears I cried. I cannot escape this terrible grief, no matter where I hide. I cannot get that horrible day out of my mind, although I have tried. The phone call, the terrible news and visions are always in the way. Grief shows no mercy and takes me on a terrible never-ending ride. I promise you this; my endless love for you will never fade away. I say a prayer and feel thankful that when I wake, I can remember you another day. Everyone misses you "Big D"
DANIELLE'S MEMORIAL PATIO , Southington CT.
To fade into the rising sun. For I am all I've done. You'll hear me call across the sky. Then I will never die. My love is with you Oh, sweet Danielle, what can I say? My heart is empty without you each day. If only I could reach out and touch your hand. Which could help dry the tears that I cry. So let's make a deal, just me and you. You look for me with all your might. And together we can send our love and say good night. And the emptiness I feel will not go away. My angel in heaven looking down on me. Because, Danielle, in my heart is where you belong. I love you, darling, sleep well, my daughter. Now will you give her all your love? Nor hate me when I call her back again? Just look for me, Mother and father, I'm everyplace!